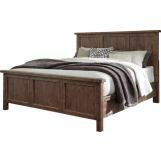 Made with Pine solids and veneers in a light brown tone with significant distressing and aged detailing. Massive scale offers a true departure from current products. Wide bulky pilasters and case features with cross buck side overlays. Planking effect on tops and bed panels constructed in multiple thickness veneers for a hand-made effect. 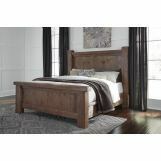 Bed has large posts and wide, deep overhang on footboard top. Cases feature recessed bolt head accent. Drawer boxes are dovetailed and fully finished with metal ball bearing side guides for smooth function. Hardware uses an industrial styled bar pull and round knob finished in a textural vintage bronze color.